Dear Evelyn is the story of a long marriage (over 70 years), and how that marriage and the individuals involved change over the years; sometimes in a good way, often not, but always in a way that is moving and complex. Harry and Evelyn meet and fall in love right before the Second World War, so the first several years of their marriage are spent enduring long months apart, interspersed with periods of hard-core passionate togetherness. When they are finally able to settle down, they have to learn how to be together day in and day out, with the added pressure of parenthood. In addition, Harry and Evelyn are very different people. Evelyn is strong, proud, determined, and can come across as cold compared to Harry’s warmth and gentleness. He bends over backwards to ensure things go smoothly for Evelyn; so that nothing upsets her. He is sometimes successful, but many times he is not. Their differences might have initially attracted them to each other, but they certainly cause tension and friction down the road. This was Evelyn: strong, hungry, wilful, beautiful, sometimes kind, sometimes harsh: completely extraordinary. The woman he had met on the steps thirty-five years ago had changed only in degree. He had chosen her and continued to do so. What love was had changed to the point that he no longer understood it, though he knew its scale and depths, and knew that it was most of who he was. One thing Harry sacrifices, for a life with Evelyn that includes financial security, is his love of reading and writing. He reads when he can, and writes very little. But his love of poetry and words surface in the story from time to time, adding another layer of interest for book lovers. Evelyn, as well, reflects on a few of the novels she’s read over the years. Modern novels, in general, she felt, were perhaps better avoided. You never knew what was going to jump out of them. Later in life, Evelyn and Harry can be downright hostile towards each other. It’s painful to see Evelyn’s criticism and even disgust being targeted at Harry. Harry annoys the hell out of her with his morbid silences. But at least he’s silent. She was sick and tired of the whole damned razor thing and of Harry and of her daughters — who argued with her, were too sentimental, too intellectual, and far too young to understand. The reader knows that the love is still there, underneath the pile-up of arguments and incidents over the years. But Harry and Evelyn don’t know for sure. They can only see what’s in front of them – shortened fuses and worn-out bodies. Is there any love left there? How to find it under all the stubborn pride and resentment, under the sore hips and the incontinence? It seems to be easier to complain about the bad than to remember the good. This journey that they go on is accompanied by the reader. We know their backgrounds, see where they’re coming from, yet still struggle to understand them. We approve and disapprove, but remain sympathetic because we know them, and we know that they are both trying. Trying to keep a marriage going while also bringing up three children, working, mourning lost time and unfulfilled passions. And this, for seventy years. They had their whole lives ahead of them, and before they knew it they were at the end. Kathy Page writes with compassion for her characters. At times, it’s tempting to take sides, or to become infuriated with one (or both) of them. But as Kirkus writes in their review: Kathy Page “remains devoted to both and forgiving to the end“. Intense emotion… may seem like madness to those who do not share it. 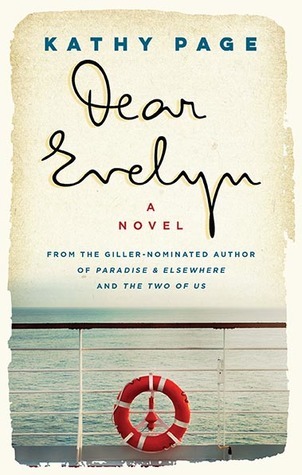 Dear Evelyn is a finalist for the Rogers Writers’ Trust Fiction Prize. Kathy Page is the author of several other books and short stories, including the Giller Prize nominated The Two of Us, which I read and reviewed in 2016. Thanks to Biblioasis for sending me a copy of this book! Wow – I know how that feels. Suddenly feeling our mortality in our 60s. Like Naomi – I too gave it 5-stars! Even after 20 years of marriage, I can feel that time just flying by. But, wow, 70 years is a long time! This sounds right up my alley. The premise reminds me of Addison Jones’ Wait For Me, Jack which I loved. Great review, Naomi. Yes, Susan! I think this is a book for you! Sounds like a book about my parents! Gosh, sounds very interesting. I’ve only been married 4 years but it is an odd thing, in a way, isn’t it, a marriage (we’ve been together wayyy longer than that but the marriage changed things) (not in a bad way). I like that line about the passing of time too – seems to encapsulate the whole book in nutshell. Lovely review as ever, Naomi. How neat that the author used excerpts from her own father’s letters! That makes me more interested in reading it. It seems like a sad book, but one that resonated with you in some ways? It has sad moments, but I wouldn’t say the book is sad. Maybe an emotional book? Many happy moments as well. Just like life, I guess! It definitely resonates. I’d say it would resonate with anyone who feels the time slipping by and wonders where it has gone. My husband and I have been a couple for 13 years, and we often reflect in how we’ve changed. I don’t think it’s romantic to say things like “you’re still the girl I married.” Such thoughts lead us to think we can’t grow or change, or look different than we did when we were 22-23, whatever. Then again, I can’t imagine 70 years of marriage, either. And we don’t have kids, and that makes a huge difference I’m sure. That definitely makes sense. In always terrified by the idea of kids splitting my devotion. I was alone and didn’t trust anyone for so long that I have a “two against the world” mentality. If there were more people (children), where would they fit into that? ‘He had chosen her and continued to do so’. How beautiful is that? It’s such a gorgeous book, and so atmospheric. I was especially impressed that, although she uses her parents’ romance as a starting point, there’s never that sense of authorial holding back that you often get when people fictionalise their forebears – Harry and Evelyn are full characters who do sad and mean things to each other as well as displaying tenderness and affection. I’d love to see it on the Women’s Prize list. Exactly! I was hoping it would make it onto the Giller list, but the Women’s Prize List would be nice, too! I hear you! Even with its ups and downs, it’s nice to read a book with characters that demonstrate that it *can* be done! Bonnie Burnard said, about writing A Good House, that she was writing because so many books existed about fragmented families and she wanted to write a story about the people who chose to say and make things work: I loved that (and the book) and I bet she would have been a huge advocate of Kathy Page’s novel. I’ve only read the first 50 pages but I just loved it and I think it’s one that I want to own, although the copy I’m currently reading is a library loan. I was thrilled to see it on the Writers Trust list! I would love that, too! I guess I’ll have to read it. And that’s one of the things I love about “Unless”, even though that’s not really what the book is about. There’s quite a lot in there about their long, enduring togetherness. Thumbing through is always a good idea!